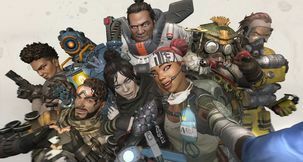 It’s a rare thing among videogames to stay both faithful to such a rich universe as Tolkien’s, and also manage to weave a new story that’s got something for gamers to sink their teeth into. WB Games and Monolith feel a Ranger from Gondor stuck with duty on Mordor’s border is the perfect place. We take the role of Talion, a Ranger that’s soon thrust into the harsh reality that Mordor and Sauron’s forces aren’t quite as dormant and broken as Gondor has been led to believe all these years. The opening moments of the game are, as you’d expect, a tutorial in the guise of introducing you to the Shadow of Mordor. We get a crash course in sneaking, basic combat and are then thrown into the open world of this pre-Lord of the Rings slice of Middle-Earth. It doesn’t take long to see how death in Monolith’s take on Mordor isn’t quite what we’re used to. 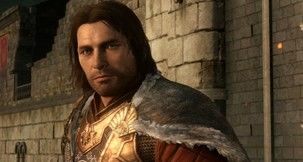 In fact it’s part of the story itself that Talion is denied his final rest, as cruelly as it was delivered by The Black Hand. Our Ranger is bound to an ancient Elven spirit who has something to do with why Talion is singled out during the opening moments of the game. This also gives the perfect plot device to experience Wraith powers, which are not only neat and pretty cool to use but become essential to survival once we start taking on Sauron’s would-be army. 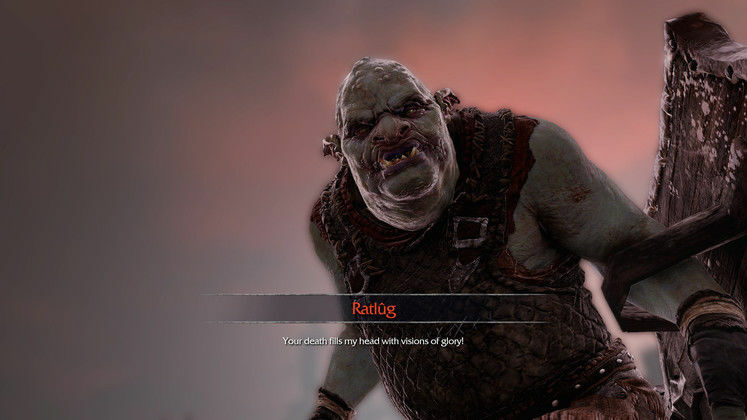 Never before I have played an open world third-person action game that involved so much running away, but Shadow of Mordor is full of ‘tactical retreat’ moments you’ll be facing, otherwise you’ll just be whisked back up one of the few towers spread throughout the game world for fast travel. 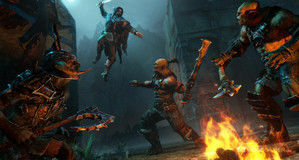 Combat itself is inspired by the close-up brawls and acrobatics from the likes of Rocksteady’s Batman: Arkham series, and Ubisoft’s Assassin’s Creed. That’s not exactly a problem although Shadow of Mordor can at times become a little unwieldy with enough foes and obstacles surrounding you. Counters to enemy attacks are generally easy to do with a single button, but dodging can run into trouble and those sharp pikes hurt – a lot. Traversing the game world does borrow heavily from the two blockbusters I mentioned, but Monolith has done enough to make it their own. 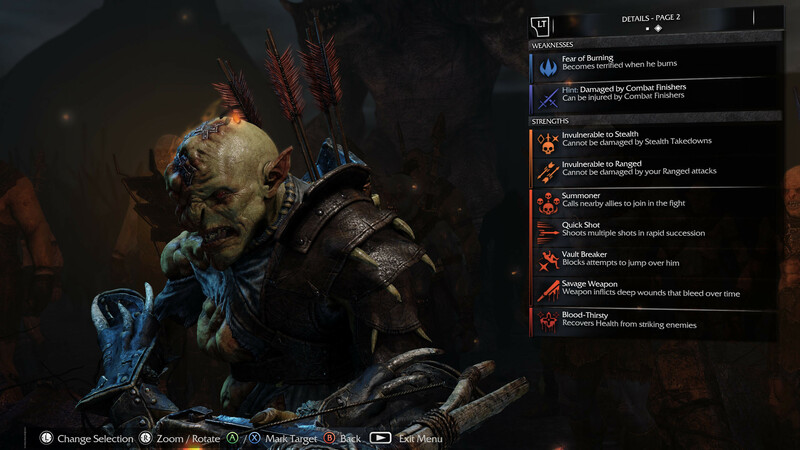 As you keep slaying orcs and uruks in your travels you’ll be accumulating experience which you can eventually spend on new abilities, or some that unlock during specific story missions, so you can begin to see some unique flavours emerge. 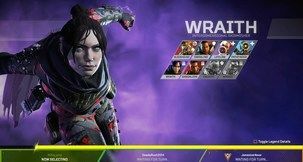 One of our Wraith abilities will let us use our bow to teleport to a target for instance, helping us get out of a tight spot. Then there’s always covering ground riding a Caragor, or even a mighty Rancor-like Gruag. Enemies are for the most part a generic horde you’ll be swinging a blade through or firing an arrow at, but that’s where Monolith’s Nemesis system plays its part. Sure you’ll be wading through the grunts of Mordor but very quickly you’ll find yourself being introduced to the higher echelons of orc and uruk society. Captains aren’t your average grunt as they’re much tougher with greater strengths, and early on they’ll have some debilitating weaknesses to exploit like a crippling fear of being burned. Each of the captains – all the way to warchief – have their own name and ‘motivations’ to give a sense of what they’re thinking. The more interesting part about this system is how easily the deck can be reshuffled. As you start picking them off lesser uruks and orcs will rise to take their place. This means there’ll always be a command structure for Sauron’s army but it also provides an endless array of more challenging foes, as Monolith attempt to make them ‘unique’. It’s a façade to be sure as they end up spouting the same insults eventually, and the models are recycled with variations, but it’s a neat little trick that does try to keep things appearing fresh. To help the Nemesis feature more is the ‘memory’ these captains will have of previous encounters with Talion, so much so that they could be all bandaged up, their eyes turned milky white, or gloating you’ve yet to beat them at all and instead died by their hands many times. If you think it’s easy to take these guys out then you’ll be rudely awakened. Just because we’re a Ranger doesn’t mean battles will be easy. As soon as those uruks start swarming around things get heated fast. Eavesdropping on banter is another good little part of the wider game as we hear uruks discussing ‘what they’ve heard’ about Talion’s exploits, and some even boasting they he could never do what he’s done to their warchief – they just can’t conceive it. Scratching out these captains not only increases our own power rating, which serves as another kind of levelling system to unlock tiers of abilities, but also provides us a source of runes. These runes will drop when the captains are defeated and can be slotted into our three weapons. What rune drops depends on the weapon used for the killing blow, and these runes also have their own rating with ‘epic’ reserved for more visceral encounters – most likely with a warchief. The runes carry all manner of bonuses for our three weapons, and more can be slotted as we purchased upgrades with a special currency we earn through completing bonus objectives, side missions and finding artefacts. These side attractions open up as we progress with the main story and range from completing weapon-specific challenges which are said to build the legend of our weapons, to helping poor enslaved men escape their uruk captors. There’s even a little hunting challenge going on which starts small with spiders but soon ramps up, and one for herbs too. A lot of the bigger battles actually require some planning in Shadow of Mordor. 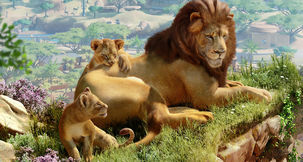 Simply strolling into a stronghold is going to get a small army – an actual small army – of foes bearing down on you. It’s wise to play it smart and get the lay of the land. If you’re after a captain or warchief then thinning his ranks first is the smart play. We get various environmental elements to help out with this, like knocking a hive of flies that can terrify uruks and orcs. There are even caragor cages to be shot open to let chaos ensue, or perhaps a poisonous spiking of grog barrels so they drink themselves either dead, or into a mutinous frenzy as they accuse each other. In the latter half of the game things switch up as you no longer have to just slice and dice your way through the uruk hierarchy, but can instead brand them as puppets that’ll do your bidding. It’s definitely a welcome change of pace, tactics and fun than just butchering a load more generated captains. It allows for some pretty interesting power struggles as you effectively ‘gain control’ to a degree. 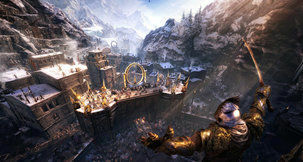 Combat is heavily in the Arkham category of almost rhythm-based close-quarter combat, while traversing the land is decidedly Assassin’s Creed in free-running up walls, climbing cliffs and ambling across buildings. It’s a strong alliance in Shadow of Mordor but they’re not without their troubles, as Talion can at times be seriously hobbled by his environment that results in some frustrating defeats and setbacks. 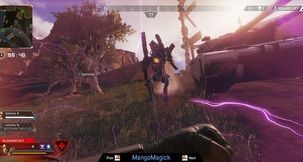 The game’s camera can also ruin the flow of combat, or an expedient retreat, as it gets caught on walls and objects that leave you in the dark as to how close an enemy can be. Once it even got on the wrong side of a wall. 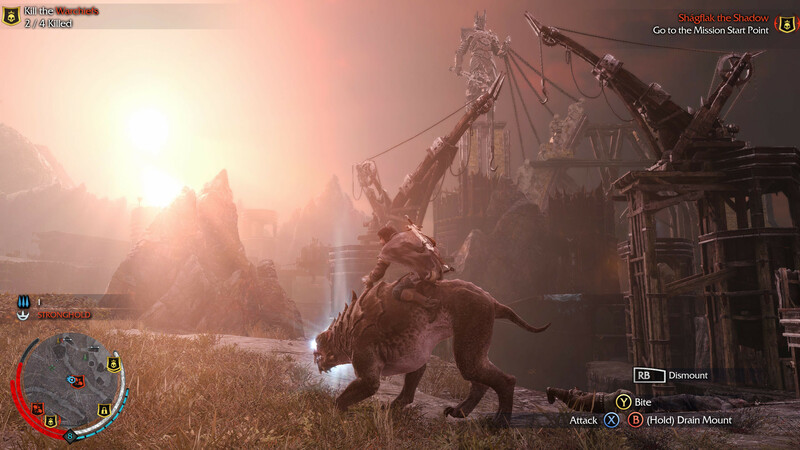 Graphically Shadow of Mordor is aesthetically aligned to Peter Jackson’s vision of Middle-Earth, and the high and ultra texture settings – while not that different from one another – do help to bring the otherwise oppressive and gloomy Mordor to life. Stuttering did occur with the ultra settings at 2560x1440, but thankfully were few and far between. I was using a GeForce GTX 780 Ti with 3GB VRAM, which is apparently half of the recommended specs for ultra at 1080p, yet it runs well. Middle-Earth: Shadow of Mordor is a strong foray into the Tolkien universe, backed up by popular combat from other major action series, with its own free-running style to boot. The Nemisis system does keep things a little fresh even if after a while it’s illusion of orc and uruk society does start to break down. The fact these captains are going about their business just as we are helps it feel more chaotic. It is without a doubt the best experience set in Middle-Earth, but also stacks up against any action fantasy adventure, whether with a cape and cowl or haystack diving. Despite its flaws the Nemesis system can give some great moments, and finding an uruk captain is still alive even after being burnt, interrogated and even stabbed in the neck, it makes taking on these mini-bosses all the more satisfying – even if they ‘kill’ you.